Greetings from Ottawa! Our city has been a-buzz lately with the news and action surrounding Attawapiskat First Nation Chief Theresa Spence and the Idle No More Movement. With all the information and conflicting stories swirling about in mainstream and social media channels, I decided to attend a rally myself to both show support and to experience this “history in the making” first-hand. 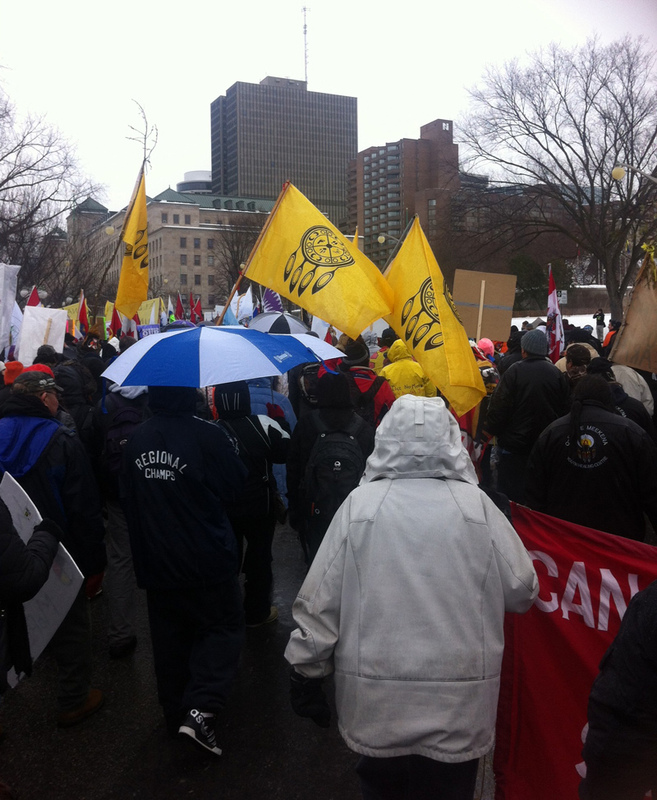 I attended the January 11th rally, where some 3,000 people walked from Victoria Island to Parliament Hill. As I walked alongside and among strangers I reflected on my own family’s history and realized just how much, and how little, I understood about what was going on. A pivotal and key part of the Japanese Canadian redress movement was to educate Canadians on the complex injustices of dispossession, internment, and relocation; this was a part of Canadian history that had been refused entry into the dominant historical narrative of Canada for many decades. Many Canadians flatly denied these injustices. Many Canadians had no idea whatsoever of the issues. However, many Canadians also supported the movement, showed up at rallies, and wrote letters – they observed, listened, and learned. As I walked with strangers – as I observed, listened, and learned – I couldn’t help but feel connected. Even though the details of Japanese Canadian experiences in Canada are very different from that of First Peoples, what we have shared is a struggle to make our pasts, and thus our Canadian present at any given moment, known. In 1975, CBC radio’s Judy Lamarche interviewed David Suzuki wherein he stated: “I feel as a Canadian who happens to have been put in a concentration camp because I was Japanese I have a special responsibility and that is not to forget how fragile democracies and guarantees are.” I reflected on that “fragile democracy” while walking. I reflected on how the War Measures Act made a gross abrogation of human rights a “legal” process in 1942. I reflected on how I have been able to live my entire life without knowing what a treaty means in the Canadian context; the only reason why I know today is because I actively cared to learn. I reflected on what First Peoples are saying – shouting! 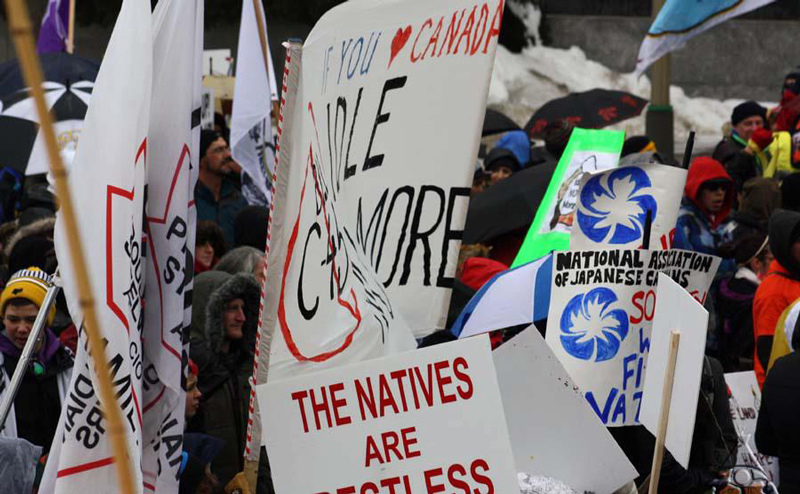 – about how Bill C-45 will negatively impact their communities and all Canadians. I reflected on the parallels I saw between the redress movement and this rally. Through Japanese Canadian voices like David Suzuki’s, Joy Kogawa’s, Ken Adachi’s, the National Association of Japanese Canadians,’ and individual community members,’ Canadians had the opportunity to observe, listen, and learn about Japanese Canadian experience – not only the suffering and injustice, but the beauty of our Japanese cultural heritage… and people listened. No longer were Japanese Canadians known only as spoken about or on behalf of by “experts” or “analysts” such as politicians, journalists, or academics. Today, all Canadians have an unprecedented opportunity to listen to the voices of First Peoples telling us about their interactions with the government, the beauty and importance of their cultures, this long struggle, and their lives. What I personally took from that day and this moment, was/is a renewed commitment to listen to people – not only with my ears and my mind, but with my heart, with my history, with my whole self. I have so much to learn – and to unlearn. I choose to listen to the voices of the First Peoples’ speaking now. I know that these communities know what is best for them. I know that I certainly do not. Jennifer Matsunaga is President of the Ottawa Japanese Community Association. Matt Miwa and Kenji Tokawa also marched with her on the day in question.